Ever since I joined that Goethe Institut online library, my English reads have considerably piled up. But like any freshly joined library, it is just too addictive. Ich nannte ihn Krawatte was the first book I randomly selected and it was the start of my non-stop German reading. I hope this has a translation, because you have to read it! The most fascinating thing about this book is that the author is Austrian with Japanese roots. 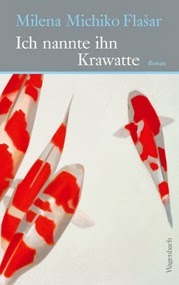 Ich nannte ihn Krawatte is set in Japan and describes some really intriguing aspects of Japanese society. It's like reading Ishiguro: it has that wistful Japanese tone of writing, without the disconnected, pieced together feel of a translation. The only difference is that this particular original is in German. Summary: A hikikomori is a young person who has distanced himself from society and reduced contact with family to a minimum; a recluse. The word literally means pulling inward. In "Ich nannte ihn Krawatte" by Milena Michiko Flašar, our narrator is a hikikomori. The story he tells us is of a friendship that helped bring him out of isolation. He has a lot to say about his unlikely friend, as he waits for him in a Tokyo park: "Ich nannte ihn Krawatte" that is, "I called him Tie". Tetsu is much older than the narrator, a typical salaryman in a suit and tie, who spent his afternoons, like the narrator, on a park bench. What separated the two from the normal park visitors was their obvious boredom with life. A tentative chat developed into a friendship, and our narrator finds himself freely speaking his mind, after years of silence. Through their conversations we discover that their lives are grayer than they appear. The book does not have a linear plot. It has a string of one- or two-page musings for chapters, and the author has left it up to us to add the connectors. The author has a way with creating characters that makes the chaotic plot cease to matter. There is a realistic contrast between the voices of the younger and the older man. There are two characters, whom you get to hear about through the thoughts of the two men, only to meet them later on in the book and discover that they are flesh-and-blood as the two friends. The book made me think about people, dealing with loss and how everyone has problems and you never know what those around you are thinking, and you might have it better and easier than them. It is about feeling alone and incomplete in a crowd and wanting people to want you; only to realize that you can only be part of a crowd by inviting them in. It's about the small and big lessons you learn in life, the people who teach you them and how every little action matters. It's about loving someone and not knowing that they love you back. About being afraid and being afraid to admit that you're afraid. The narrator also talks about regrets, about things you should have done, things you wanted to do, but never could and how they have a much lasting effect than all the things you regret doing. The most important details are those that are left out of the story. After all those ruminations, it's at once nice and heart breaking when he seems to understand that it is wholly up to him to restart his life. There was only thing, according to me, that the story could have done without - the abruptly racing plot in the very last pages, and the meticulous tying up of loose ends. That being said, the book is not too stretched out, only a couple of hundred pages make a nice read. This does sound like a great read. It seems to be in the process of being translated to English. I have put it on my Wish List. camerahumana - That is great news! I'll be sure to check it out.